If you own a pet, you know that accidents happen. Even the most well-trained pets can create a mess from time to time. Cleaning up after these accidents can be tedious and even hazardous if you use a commercial cleaner that is full of toxic chemicals and fragrances, not to mention expensive. 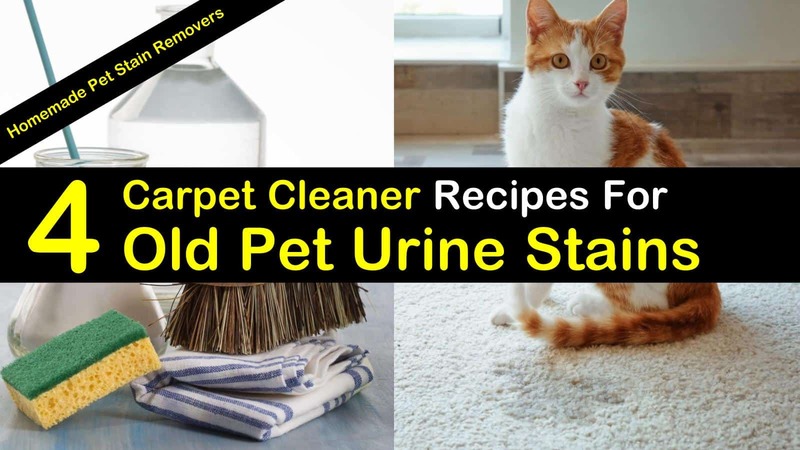 Luckily, there are many homemade carpet cleaner for old pet urine stains and all-natural store-bought cleaners that you can use to remove pet stains from your carpet and eliminate the offending odor. There are several things that you need to do to treat your pet stains, so they don’t leave a permanent mark. 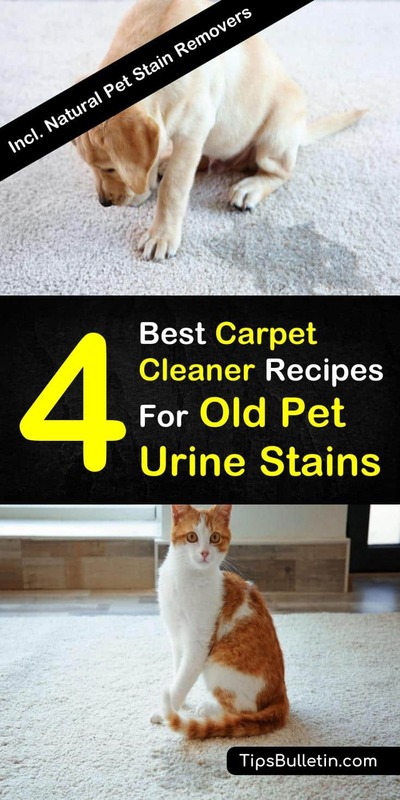 These general tips for pet urine stain removal are essential to follow to eliminate the problem. Treat the pet stain immediately. Blot the pet urine as much as you can with paper towels, a rag, or newspaper. So as not to spread the pet urine further, work from the outside of the stain inward. To remove urine stains from a mattress or carpet, you have to treat all the layers, including the carpet, padding, and any other under layers. Accidents are just a part of life for pet owners. From urine to vomit, pets can quickly make a smelly mess on our carpets and upholstery. Cleaning up old pet urine can be messy work, but it is essential to do more than just mask the odor. Until you eradicate all traces of the urine, the pet odor will continue to resurface. Making a homemade pet stain remover is simple. They use natural, everyday ingredients that you can find in your kitchen. This DIY pet stain remover is one of the most straightforward carpet cleaning solutions for removing pet stains from carpet. It is inexpensive to make and works great for treating blood and urine stains. The white vinegar in this solution will even get rid of old dog urine stains, while the baking soda will eliminate the urine odor from the carpet fibers. Combine the water and vinegar in a large bowl. Shake to mix thoroughly. Blot the spot with paper towels to soak up any excess urine. Sprinkle an ample amount of baking soda over the affected area. Pour the water and vinegar over the baking soda. This will create a mini cleaning volcano that will eat away at the stain. Allow the mixture to sit for five minutes to get the full benefits of the ingredients. With a clean, soft cloth, gently rub and blot the area until dry. Hydrogen peroxide is great for dog urine and other pet stains, as it breaks down the crystals of the urine and pulls out the stains. The natural deodorizing properties of the baking soda helps to eliminate the pet pee smell associated with pet stains. Before using this method, test your carpet for colorfastness in an inconspicuous area. Using paper towels or a clean, dry cloth, soak up the excess liquid from the carpet. Sprinkle a handful of baking soda over the stain. Mix the hydrogen peroxide and dish soap. Pour the solution over the baking soda. With a scrub brush or old toothbrush, gently scrub the solution into the carpet fibers. Let the area sit for 15 minutes, then vacuum thoroughly. Repeat the process if necessary. Dog pee and other pet urine will quickly start to smell like ammonia. This pungent smell can be difficult to remove unless you completely take care of the problem. Using a cleaning solution that contains enzymes helps to digest and break down the odors and stains at a molecular level. Making a homemade enzyme cleaner is simple and inexpensive. In a container large enough to hold the peels and liquid, add the brown sugar and peels. Pour the water into the bottle. Place the cap back on and thoroughly shake the container to ensure the ingredients are mixed. Loosen, the lid, leaving it halfway on to release the gases, so the bottle doesn’t explode. Let the components sit for three months. When the cleaner is ready, use on pet stains to remove odors and lift the stain from the carpet fibers. Once you’ve effectively removed pet stains and odors from your carpet, you want to make sure that they don’t re-stain the area. Rosemary essential oils will help to deter your pets from marking an area that you have already treated. Combine the boiling water and Castile soap in a glass quart jar. Stir the mixture until the soap is completely melted. Allow the liquid to cool. Add the rosemary essential oil and rubbing alcohol to the solution. Screw the lid back on and shake thoroughly. After you’ve cleaned up the pet stain, pour about a teaspoon of the rosemary solution onto a scrub brush. Scrub the stain with the brush, making sure to work your way from the outer edge to the center. Allow the mixture to sit for about 10 minutes, then blot dry with a clean cloth. If making a homemade carpet cleaner for pet stains isn’t an option for you, there are several all-natural cleaning solutions that work well. These cleaners are specially formulated to remove pet stains, as well as the odors that accompany them. Many of the commercial products contain ingredients like enzymes and infused oxygen and are capable of removing grease, vomit, dirt, urine, blood, and feces stains from your carpet. A bacteria-based formula that produces enzymes when it comes in contact with biological materials to help eliminate organic odors and stains. Along with removing pet stains, it removes odors, leaving a fresh, light citrus scent. Bubba’s pet stain and odor terminator is the best professional grade carpet cleaning solution around. With billions of enzymes that go to work on pet stains and odors, that clean down to the padding level to get the job done the first time. The professional strength stain and odor remover eat away at organic stains without resorting to adding harsh chemicals or fragrances. It works on poop, pee, vomit, slobber, blood, juice, food, and any other organic waste that may stain your carpet. We love our furry, four-legged friends, but not the stains and messes they may sometimes leave behind on the carpet. While there is no way to avoid the messes left by our pets, you can effectively remove stains and eliminate the odors caused by accidents. Taking care of the mess immediately with a homemade or store-bought carpet cleaner will help you avoid lasting stains and disgusting odors. We hope you found some useful information in this article that you can use in your home. Please feel free to share this article with everyone you know.